CCNMTL's biennial New Media in Education (NME) Conference will be held on Friday, October 22, 2010 at the Faculty House. This day-long event is for faculty, instructors, and the Columbia community to discover creative applications of new media technologies in the classroom. From pedagogical principles to practical applications, the NME 2010 will explore a variety of hot topics in higher education, including the implications, best practices, and effects of new media and technology in teaching and learning. 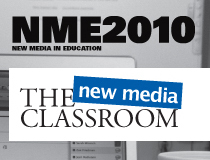 Now in its fifth iteration, the NME 2010 will offer seminars and an optional lunch session. The seminars will feature educational technology experts who will share their first-hand experiences on partnering with faculty to integrate new media in education. View the full NME 2010 agenda and register below.